Those of who visit my blog every week may have wondered where did this Thursday’s post go? Well it’s very much here but a bit delayed. Well here’s the reason….Thanksgiving turned most American cities into shoppers’ paradise. The temptations of cool discounts and hot deals on Black Friday got the better of me. I also fell prey and asked the husband to accompany me on a shopping spree. He relented but only to shoponline (like most men, he hates shopping too!!). We were both determined to clinch the best deals for the much needed gizmos to fill up our newly set up house. We diligently made a fairly long shopping list and gatecrashed all major e-tailers as soon as the deals went Live! The anticipation and excitement that had built up over several weeks died an abrupt death within 10 minutes…. Most electronics on ‘hot’ sale were substandard, nondescript brands. The discount on the desirable ones was only a trifle more than that on any other Friday…Black or otherwise. We drifted away from electronics towards clothes and toiletries. The new proposition was better; deals looks fair and discounts appeared promising. But the options were overwhelming and buried under a long day’s exhaustion and weariness, we eventually ended up undecided. Tired and frustrated, we shut down the laptop and dozed off. Whoa, what a waste of time!!! Anyways, this morning, I baked a spiced cake to get back into the holiday spirit ………’spices’ with cake sounds amusing, right? 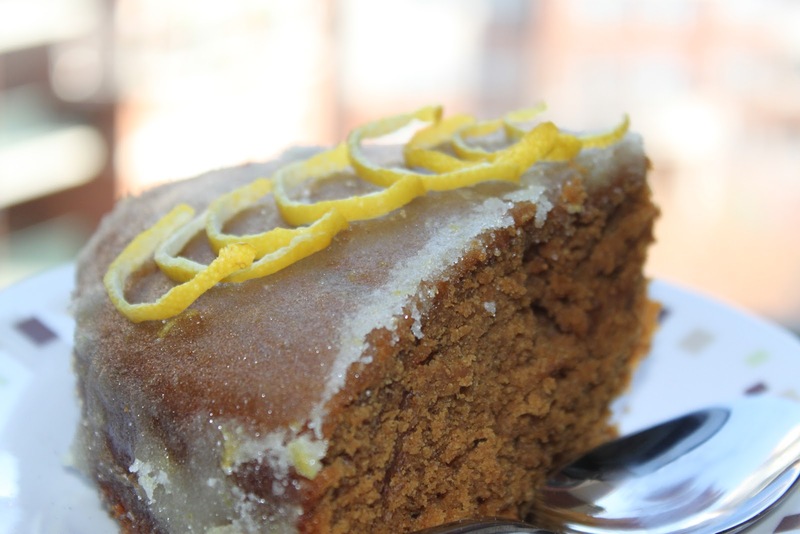 Believe me, the spices and lemon combine well and you must try this refreshingly different Gingerbread Cake!! If you have perfected some equally unusual cake recipes, I would love to hear about it and get the recipe. Look forward to your comments and feedback! All the best for your season’s shopping spree! Once the cake cools down a bit, remove it from the pan and transfer onto a plate. While the cake is still warm, pour the lemon glaze mix in the center of the cake’s surface. Spread out the glaze with a spatula to cover the surface. Allow a bit of icing to drip down the sides of the cake.